Take corn and mayonnaise in a bowl. Add a pinch of pepper powder. Apply Butter on one side of breads. 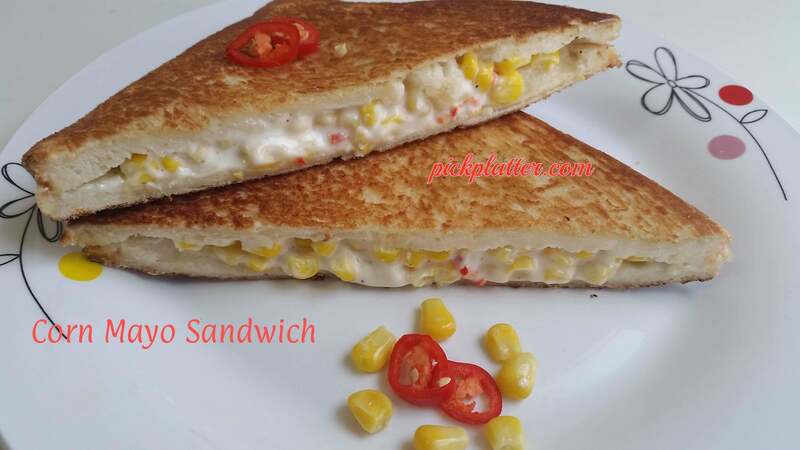 On the other side of one bread, spread a thick layer of mayonnaise and corn mixture evenly. Place few sliced pieces of red chili or red bell pepper on it. Cover it with another bread slice. When tawa/pan is medium hot add 1/2 tbsp butter on it. Now place the sandwich on tawa/pan with spreading the butter. Now place a flat surfaced plate on the sandwich. On top of plate, place a weight. Toast like this for few seconds. When base becomes brown, flip it. Again add 1/2 tbsp butter, spread it and place the plate and weight on it. Again toast for few seconds on low flame till the base become golden and crisp. Once sandwich is brown and crisp from both sides, remove the plate. Serve Sandwich hot with tomato ketchup and green chutney.